Bill Henderson was born in Vancouver in 1944. He learned guitar and became the guitarist for the Panarama Trio that performed at the Panarama Roof dance club on the 15th Floor of the Hotel Vancouver. He formed the psychedelic pop-rock Vancouver band, The Collectors, in 1966. The band had a string of local hits, including “Fisherwoman” and “Lydia Purple”, with Howie Vickers as lead vocalist. After Vickers left the band in 1969, Bill Henderson was featured on one of the Collectors last hits, “I Must Have Been Blind”, in 1970. Henderson (vocals, guitar), Claire Lawrence (saxophone, keyboards), Ross Turney (drums) and Glenn Miller (bass) were all Collectors remaining bandmates. They soon changed their name to Chilliwack. The name was a Salish First Nations name that means “going back up” and is the name of a city in the Fraser Valley in British Columbia. Chilliwack had their first Top Ten hit in Vancouver with “Lonesome Mary” in 1971. According to Skelly, Chilliwack’s record company, A&M, “fumbled by wasting “Ridin'” as the flip side to “Lonesome Mary”. An ode to train travel, it had a jangly Byrds meets CS&N vibe. Unfortunately, “Ridin'” was the only obvious followup single. Likely, realizing the mistake, A&M supposedly flew the band down to whip off a pair of straight up rockers: “Hit Him With Another Egg” and “Rock n Roll Music”. I never heard the finished but never-released product.” Skelly writes that later re-recorded versions of these songs ended up as tracks on a subsequent album, All Over You, but these were not as good as their first recordings. Chilliwack released three albums between All Over You, Riding High and Rockerbox between December 1972 and December 1975. Aside from “Crazy Talk“, from the Riding High album, their single releases received minor attention outside of radio markets in BC. In January 1977 the band recorded their sixth studio album, Dreams, Dreams, Dreams. At the time the band members were all involved with Scientology and there was a dedication to the founder of the Church of Scientology, Ron L. Hubbard, on the back of the album. 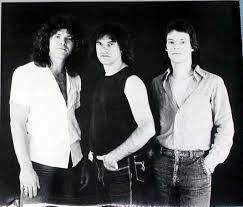 By 1977 the bands musicians consisted of Henderson, Turney, Miller and Howard Froese on guitar, vocals, solina and piano. The album included several successful single releases in the Canadian market that included “Fly At Night”, “California Girl” and “Baby Blue”. But it was the band’s ninth album release in 1981, Wanna Be A Star, that took them to the pinnacle of their success. The single “My Girl (Gone, Gone, Gone)”, went Top 30 on the Billboard Hot 100, #3 nationally in Canada and #1 in Vancouver. Nonetheless, several follow-up singles and albums failed to keep the band on the radar of American listening audiences. One of these was “(Don’t Wanna) Live For A Living”, a track from Wanna Be A Star which was the third single release from the album. 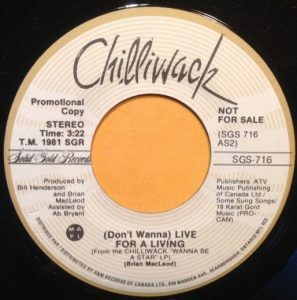 In “(Don’t Wanna) Live For A Living” Chilliwack is singing about the rat race, where people are trying to get ahead financially, only to find that after paying for rent and groceries they have nothing left. The singer is working nine to five, doing double shifts, working day shifts and night shifts. The stress of trying to pay bills is likely a source of stress and tension that results in arguments at home. With a constant focus on working to pay the bills members of the working class have little time for a social life and pursuing romance. A lot of people could relate to the song in Vancouver. And since 1982, the challenge of trying to make a living and “make ends meet” in Vancouver (and elsewhere) has become harder for most people. Behind the specifics of the rat race of trying to pay monthly bills, the song asks what are we living for? Is it just to pay bills? Is there more to life than the weekly grind? “(Don’t Wanna) Live For A Living” climbed to #12 in Vancouver, #11 in Moose Jaw, Saskatchewan, and #10 in Winnipeg. In the early 80’s there were other songs concerning obstacles posed in a working life. Dolly Parton in her song, “9 to 5”, sang about an empowered (if challenged) working woman that include these lyrics: Workin’ 9 to 5, what a way to make a livin’/Barely gettin’ by, it’s all takin’ and no given’/They just use your mind and they never give you credit/It’s enough to drive you crazy if you let it. Meanwhile, in the song “9 to 5 (Morning Train)” Sheena Easton sang about a passive, love-struck woman waiting around at home all day for her lover to return from his job. By 1984 Chilliwack was without a recording contract. Chilliwack has continued to perform over the decades with various line-ups. Earlier this decade Chilliwack appeared at Ambleside Park in West Vancouver as part of a summer series of concerts. At the performance Henderson’s daughters sang vocals on “Baby Blue”.